For at least the last fifty thousand years, and probably much longer, people have practiced religion. Yet little attention has been given, either by believers or atheists, to the question of whether this universal human behavior might have an evolutionary basis. Did religion evolve, in other words, because it helped people in early societies survive? 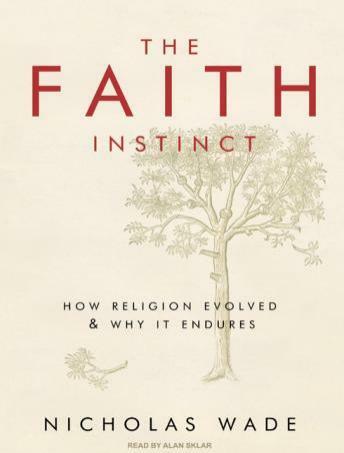 In this original and controversial book, Nicholas Wade, a longtime reporter for the New York Times's Science section, gathers new evidence showing why religion became so essential in the course of human evolution and how an instinct for faith has been hardwired into human nature. This startling thesis is sure to catch the attention of both believers and nonbelievers. People of faith may not warm to the view that the mind's receptivity to religion has been shaped by evolution. Atheists may not embrace the idea that religious expression evolved because it conferred essential benefits on ancient societies and their successors. As The Faith Instinct argues, however, both groups must address the fact, little understood before now, that religious behavior is an evolved part of human nature. How did we evolve to believe? Wade shows that the instinct for religious behavior is wired into our neural circuits much like our ability to learn a language. Religion provided the earliest human societies with the equivalents of law and government, giving these societies an edge in the struggle for survival. As a force that binds people together and coordinates social behavior, religion supported another significant set of social behaviors: aggression and warfare. Religious behavior, both good and ill will remain an indelible component of human nature so long as human societies need the security and cohesion that belief provides. Social scientists once predicted that religion would progressively fade away as societies advanced in wealth and education. They were wrong. The first objective and nonpolemical book of its kind, The Faith Instinct reveals that to understand the persistence of faith, one must first acknowledge that religious behavior is embedded in human nature.